In England, there is talk that Joe Hart’s World Cup dream could be over. The England keeper who has been capped 75 times at national level has struggled to obtain a first team spot in David Moyes’ West Ham side. Adrian has been selected over Hart in recent months while the latter has been partaking in all other domestic competitions. However, Saturday marked a low day for the club as they fell to a 2-0 defeat to League One side Wigan Athletic. Now, Joe Hart must force his way back into the squad for the Premier League matches or faces another six months on the sidelines which would inevitably see the Manchester City loanee lose his spot on the plane to Russia. On the other hand, Angus Gunn was busy in goal for Norwich City as they come away with a hard-worked 1-0 victory away to Brentford. The home side applied the pressure in the second half as they attempted to fight back into the game, however the City defenced remained solid and resisted the pressure. Staying in the Championship, Bersant Celina featured for Ipswich Town as they were defeated 1-0 at home by leaders Wolverhampton Wanderers. The Kosovan attacker has been in fine form recently and has cemented his place in Mick McCarthy’s side. There was special praise for forgotten man Jason Denayer this weekend. The Belgian centre back is in Turkey playing his trade with Galatasaray and received the plaudits for his defensive display in his side’s 2-0 home victory to Osmanlispor. The 22-year-old completed 100% of his 60 passes and made three clearances as he put in a ten out of ten performance. Denayer has become an integral part of Galatasaray’s side appearing 15 times for the league leaders. The centre back has clearly forgotten about his woes with Sunderland and could be knocking on Roberto Martinez’s door for a place in his World Cup squad this Summer. A special mention goes out to Mikkel Diskerud. The Norwegian-born attacking playmaker could be making this feature very soon as he looks set to go out on loan. Known as ‘Mix’, the attacker had recently been starring for Patrick Vieira at our sister club New York City before seeing his contract terminated after a lack of minutes for the club. Somewhat surprisingly, it was confirmed by Umbro that the US international will be signing for Manchester City. Although there are still questions regarding the deal, it is expected that he will follow the route of Aaron Mooy in going out on loan and probably being sold on should his loan be successful. In Spain, the Manchester City loanees continue to struggle for minutes at Girona. 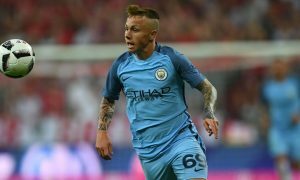 Pablo Maffeo was the only player to start the game for the Catalan side as they drew 0-0 away at Malaga. Douglas Luiz came off the bench for the final few minutes as our sister club attempted to capitalise on the hosts going down to 10 men late on. Unfortunately, Aleix Garcia continues to watch from the sidelines as he has failed to fully break into the first team squad just yet while there is some doubt still regarding the future of Olarenwaju Kayode. The Nigerian forward is expected to have his loan at Girona cut short this month and he could move to Amiens in Ligue 1 as he looks for regular game time ahead of the World Cup in Russia. NAC Breda suffered back to back defeats in the Eredivisie this week. Our Dutch affiliate side faced a vital game at home to VVV Venlo. The usual contingent of Angelino, Pablo Mari, Manu Garcia and Thierry Ambrose all started as the relegation threatened side looked to pick up a vital 3 points. However, as the game progressed, and despite NAC Breda’s dominance, the home side failed to take advantage with several missed opportunities. Ambrose was replaced after 73 minutes while Paolo Fernandes was brought on not long later as he sought to find a late equaliser. NAC have struggled this season and sit in the relegation play-off places in 16th. It has been a difficult period for Thierry Ambrose who only has 1 goal in his last 5 games and the Frenchman may be looking over his shoulder very soon after NAC Breda recently brought in highly-rated Umar Sadiq on loan from Roma. It will be interesting to see which of the two get the nod for their next tie away at Ajax. Meanwhile, Mexican starlet Uriel Antuna watched from the sidelines as his Groningen side were involved in 3-3 thriller at home to Heracles.